Canada stands at a decision point for achieving its 2020 greenhouse gas reduction target. The NRT’s original and comprehensive analysis demonstrates a large gap between Canada’s emissions trajectory and the federal government’s target of 17 per cent below 2005 levels by 2020. Further, we show that the cost of achieving the Canadian climate policy target is high owing to the short time frame remaining to meet the target, a lack of coordination by governments, and the growing emissions from some economic activities. It is getting harder, not easier, to achieve Canada’s climate policy goals the longer time goes on. This chapter sets out the main conclusions from our qualitative assessment of provincial plans and our original modelling analysis of federal and provincial emission reduction measures. It provides advice and recommendations on steps that Canadian governments should take to put us on a realistic, achievable path to our 2020 target. Canada is making progress toward its 2020 target but will not get there with only the existing and proposed measures. There is some good news in our analysis. Progress has been made and Canada will likely achieve almost half of its 2020 target, taking into account all existing and proposed emission-reduction measures. This is significantly better than previously projected by Environment Canada.71 However, given that our full analysis includes all likely policy actions by governments — large and small — the NRT can also conclude that Canada will not achieve its 2020 GHG emissions reduction target unless significant new, additional measures are taken. More will have to be done. No other conclusion is possible. Provincial policies are driving the largest portion of emission reductions to date. Climate policy actions by provincial governments account for almost three-quarters of estimated emission reductions in 2020, with only about one-quarter being derived from existing federal measures. This proportion changes leading to 2030 when existing federal measures are forecasted to account for about one-third of emission reductions. The provinces are making progress toward their own targets but almost all will need to introduce additional measures to meet them. Despite significant progress overall, only Nova Scotia and Saskatchewans are likely to achieve their targets as of now with Ontario coming close. Progress by provinces toward their own emission-reduction targets reinforces in part why Canadian progress overall is insufficient. Gaps provincially contribute to gaps nationally. This further reinforces the need for better coordination of emission-reduction actions by both levels of government since efforts by both have contributed to progress to date and will be needed to do more. 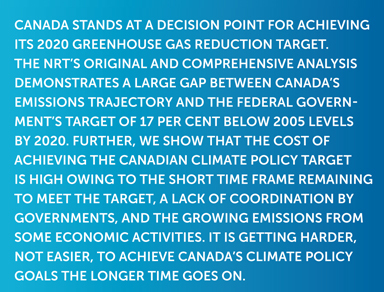 Canada will not achieve its 2020 GHG emission reductions target unless significant new, additional measures are taken. More will have to be done. No other conclusion is possible. Some proposed future measures hold potential to close part of the gap to federal and provincial targets. The federal government has indicated an intention to develop regulatory measures to reduce emissions from the burgeoning oil and gas sector as part of its sector-by-sector regulatory approach and has begun consultations with industry. As the NRT analysis shows, this sector is an important source of emission-reductions opportunities, either in terms of slowing growth trends or driving absolute reductions at some point in the future. Indeed, our cost-effectiveness analysis shows that there are emission-reduction opportunities in this sector at low, medium, and high costs that could occur over the next eight years. Given that no details exist publicly on this possible measure from the federal government, it is impossible to assess its effectiveness in reducing emissions from this sector by 2020. This will depend on when the regulations come into force and how stringent they are. No other sectors have been formally identified for regulatory action by the federal government as of 2012 so again, it is impossible to forecast a better outcome than we have currently modelled or to state with confidence that Canada will meet its 2020 target once other measures or actions are put in place. Some provinces have indicated additional measures may be forthcoming from them. Next-generation climate policy plans will come forward from Québec for 2013 and possibly Manitoba and New Brunswick. But these actions alone will not bridge the national gap, however useful they are at the provincial level and in the longer run. The fragmented national and provincial approach has created limited overlap to date but will likely be more problematic in the future. Shifts in federal policy — first away from Kyoto to an industrial emitters’ cap-and-trade program called Turning the Corner, then to the Copenhagen Accord and U.S. alignment, and now a regulatory sector-by-sector approach — have created uncertainty for provinces as to the national policy framework within which to undertake their own actions. Responding to their own perceived need and opportunity for actions, provinces have all established their own independent climate policy plans and goals. Interprovincial coordination has occurred in Atlantic Canada on targets and with Ontario, Québec, British Columbia, and Manitoba on the Western Climate Initiative. Recent decisions by the federal government to accommodate provincial actions though equivalency agreements on the coal-fired electricity generation regulation72 is another example of coordination, if after the fact. Does this fragmented “go-it-alone” approach matter? Our conclusion: not that much so far, but a lot more in the years ahead. Our analysis shows a limited amount of duplication and overlap between federal and P/T actions in emission-reduction efforts to date. In 2020, this will amount to about 10 Mt CO2e. Looking ahead, however, is a different story as this amount is expected to rise to 41 Mt CO2e by 2030. Chasing the same emission reductions by both levels of government is both inefficient and ineffective; Canada will realize fewer reductions at potentially higher costs. The cost of additional policies to close the gap will be higher on average than policies pursued to date. Our analysis shows that while almost half the emission reductions to date from existing and proposed measures have been in the low-cost range of $50 per tonne and under, achieving our 2020 target will require an increasing share of emission reductions to come from medium- and high-cost measures. A clear consequence of failing to develop a coordinated economy-wide, pan-Canadian approach to climate change is that governments have for the most part focused on the least-cost emission reductions first. As the cheapest opportunities for emission reductions are exhausted, higher cost measures will be necessary for most of the emission reductions ahead if we are to meet our 2020 target. The NRT analysis for Environment Canada reinforces a central conclusion of all our work and many other independent sources: delay is costly. Put directly, time is money. The closer the target date approaches, the higher the carbon prices will have to be to incent investment in capital stock turnover, develop and deploy and new technologies, and change firm and household energy-use behaviour. This was a conclusion we reached in our 2008 report for the Minister of the Environment at the time, called Getting to 2050, as well as our 2010 report Achieving 2050: A Carbon Pricing Policy for Canada. High projected carbon prices and resultant economic consequences played a key part in the federal government’s decision not to meet Canada’s Kyoto Protocol target and ultimately to announce withdrawal from the treaty. Now, several years later, high carbon prices needed to achieve the more modest but still stringent 2020 target may once again discourage governments from taking effective action. The sole formal mechanism for intergovernmental collaboration on the environment is the Canadian Council for the Ministers of the Environment (CCME); however, similar intergovernmental fora relating to energy and transportation may also be a useful location to discuss sector-specific aspects of climate policy. Operating by consensus, the CCME has done useful work on technical and regulatory issues such as waste and wastewater (and possibly clean air, which it is now engaged in), but has not recently been used as a forum for either discussing or engaging in broader climate policy discussions. Participants at the NRT’s Canadian Climate Policies Dialogue concluded that to date, no effective federal/provincial/territorial engagement exists for developing and implementing pan-Canadian climate policies. Concerns were raised that CCME may not be an effective vehicle to take on this role in part because of the prospect of a “joint decision trap” whereby collaboration and consensus leads to outcomes supporting the lowest common denominator. Provincial governments are concerned about the lack of provincial-federal coordination given the federal sector-by-sector regulatory approach to emission reductions. Two concerns were expressed: first, that sector-by-sector regulations would have an effect on provincial energy and climate policies already in place or underway and their regulated power utilities; and second, that the absence of any intergovernmental forum or mechanism meant that other, more effective policies such as carbon pricing were not being explored or were being effectively precluded. Bilateral equivalency agreements between the federal and provincial governments of Nova Scotia, British Columbia, and Saskatchewan (although details are lacking) may address some of these policy coordination issues. Provinces echoed the desire for greater certainty in federal and, by extension, national policy approaches. Shifts in past federal policy, from Kyoto to Turning the Corner to Copenhagen, created a policy vacuum that provinces have filled within their jurisdictional competence. Complicating any cohesive national approach is provincial natural resource ownership and the provinces’ right to determine exploitation and receive royalties from that development. With energy and emission patterns so different across the country, climate policy targets, timelines, and actions supporting emission reductions are as much a function of Canada’s political economy as it is energy economy. Reducing emissions in every other province but Alberta, for example, given its growing oil and gas sector’s contribution to forecasted emissions growth, will leave Canada short of achieving its stated target. So, what provinces do on their own matters. And, how the federal government either fills that gap with its own measures or seeks to coordinate climate policies across the country in some fashion definitely matters. All governments will need to participate to successfully meet the 2020 target. The NRT analysis shows that in order for Canada to achieve its 2020 target as cost-effectively as possible, all governments, all provinces, and all sectors will need to contribute. No one sector and no one province can make up all the difference. This puts a premium on intergovernmental collaboration and coordination of measures. But our findings demonstrate that the most important sector to contribute in this period will be oil and gas with almost half the cost-effective abatement by 2020 coming from this sector alone. Therefore the most significant province for future emission reductions will be Alberta. But this will be insufficient by itself. Other sectors such as electricity generation, manufacturing, transportation, buildings, and waste will all need to reduce emissions. This means all other provinces, notably Ontario, British Columbia, Saskatchewan, and Québec, will need to contribute additional emission reductions. 6.2	How do we move ahead? To achieve the 2020 target, Canada has a choice to make, a choice that principally lies with the federal government. That choice is either to “go it alone” or “work together.” The choice is “more of the same” or “regulations plus.” The federal government need not fundamentally alter its current regulatory, sector-by-sector approach. But it will need to complement it. To be sure it meets the 2020 target it will need to supplement current policy with a more coordinated federal-P/T approach to drive additional near-term reductions. It needs to consider how to achieve this with a more collaborative process with provinces to discuss — beginning soon and continuing regularly — how to avoid costly duplication and overlap, realize more efficient and cheaper emission reductions, and enable other tools, namely carbon pricing, to be used in conjunction with current and future policies by the federal government, a province, or a group of provinces under the framework of equivalency or memorandums of understanding. The federal government need not fundamentally alter its current regulatory, sector-by-sector approach. But it will need to accelerate and complement it. Let’s look at each key consideration for developing additional policies. Timing — The 2020 target is eight years away. This is long in terms of political cycles (two full electoral terms) but short in terms of investment and innovation cycles where capital stock can take decades to turn over. The sooner regulatory and market signals are available, the sooner the capital stock will transform to lower-emitting technologies and drive down GHG emissions. The sooner emissions begin to fall, the greater the contribution will be to limiting the cumulative stock of emissions in the atmosphere, which is better for both the environment and the economy. Certainty — “Long, loud, and legal” is a term researchers in the United Kingdom have used to describe good climate policy signals.73 Transparent and long-term rules and stringent and enforceable policy are all essential parts of developing policy certainty in our Canadian climate framework. Provinces stated this was a desirable and necessary condition to their own planning and actions (see Appendix 7.8). Flexibility — Successful climate policy balances the need for long-term policy certainty with the need to be responsive to changing developments. As the NRT set out in Achieving 2050: A Carbon Pricing Policy for Canada, key sources of uncertainty include policies of Canada’s trading partners, economic change, and distributional effects of policies.74 Observing changes over time and adjusting policies in response will enhance the success of future policies. Price — Given the remaining gap to achieving the 2020 target, there is strong interest in finding ways to achieve the best environmental outcomes at the least economic cost. Devising policies that are market-based, coincide with capital stock turnover cycles, and allow industry and others to innovate and invest in effective technologies rather than prescribing specific technological solutions are strategies to keep costs low. Burden — Climate policy, given its interconnections between energy, natural resource exploitation, and environment, is impossible to compartmentalize effectively in a federal state. Emissions are neither exclusively federal nor provincial. Yet the federal government is uniquely positioned to influence the actions of provinces, by acting or not acting itself, and by favouring some policy instruments over others. As we have seen, Canada’s emissions profile is not an even one across the country. Sources of emissions vary with Alberta, Ontario, and Québec being the largest overall contributors, but Alberta, Saskatchewan, New Brunswick, and Nova Scotia being the largest per capita contributors. This uneven distribution of emissions makes our challenge not just a significant energy/emissions one, but also a significant political economy one. An equal reduction across all provinces at this stage would be neither fair nor effective. Yet, burden-sharing in Canada is a hallmark of our unique brand of federalism and suits this policy challenge well. It is clear that a lack of it will hinder effective progress on the file. In time, there is a risk that no further action will be taken individually, if not taken collectively. Similarly, the fiscal transfer prospect of reducing emissions in one province while seemingly distributing the benefits financially to another could be perceived as unfair and likely prevent progress from occurring. Yet, jurisdictions that benefit from the exploitation of the natural resources in their jurisdiction have an obligation to contribute to addressing the environmental consequences of that exploitation. If Canada is to meet its 2020 target, then all Canadians must play their part. Collaboration — Canada’s 2020 target is a target on behalf of all Canadians. It has been committed to internationally. In theory, it can be achieved by the federal government acting alone or by the provinces and territories acting alone. In fact, this will never occur in our federation given the history of climate actions to date and the constitutional jurisdiction each level of government has in the areas of natural resources, energy, and environment. Both levels of government need to fully contribute because of the policy instruments each has and the different carbon profiles across the country. Collaboration is essential going forward unless the federal government takes full and complete responsibility for all remaining emission reductions to get to the 2020 target. Its regulatory instrument can be effective in getting new emission reductions but it will have to extend its reach to include many sectors in a short time period. Policy — While each province has a range of actions under its climate policy plans, a few key policies are driving the majority of actual emission reductions to date (e.g., phasing out coal-generated electricity plants in Ontario, a legislated renewables target in Nova Scotia, carbon tax in British Columbia). Provinces expressed the desire for more policy flexibility from the federal government in two areas: first, in terms of how its regulatory approach is being applied through better coordination via advance consultation and possible equivalency agreement; and second, in considering a modest but real national carbon pricing policy that would allow them to take more cost-effective actions in response. Assessment — Knowing where Canada is at any one time and regularly forecasting ahead to estimate future progress is basic to any sound evaluation of climate policy effectiveness. Adapting policy actions in response to regular assessments is just common sense. The NRT was asked formally by the federal minister of the environment to conduct this analysis. It is the first such forecasting analysis done and released publicly. This should be normal not exceptional. Regular presentations, analysis, and forecasts of progress under various scenarios and policy actions are a key tool for decision makers. Actions across each of these key elements are the best guarantee not just of achieving Canada’s 2020 climate policy target but also of ensuring longer-term emission reductions after 2020, which remains a global imperative to limit the dangerous consequences of climate change. We recommend that advances in future Canadian climate policy meet three tests: they should be collaborative, coherent, and considered. 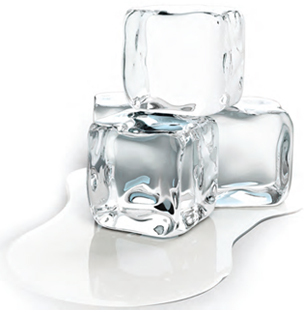 We call it 3C. The NRT offers the following advice to the Minister of the Environment, the Government of Canada, and provincial and territorial governments. We recommend that advances in future Canadian climate policy meet three tests: they should be collaborative, coherent, and considered. We call it C3. Collaborative across governments by meeting regularly and specifically on climate policy; Coherent by acting together in a coordinated way to reinforce each other’s policies and determine who is best positioned to act in one area over another; and Considered by undertaking regular progress reports and assessments of how well Canada is meeting targets and forecasting to help consider future actions. Canada needs greater intergovernmental collaboration to make sustained progress toward its climate policy goals. There is a need for a regular forum for governments to engage together on developing and implementing climate policies and actions. To ensure ongoing political engagement across governments, establish a federal/provincial/territorial ministerial-level climate policy forum led by environment ministers, and joined by energy ministers, to meet annually to discuss trends and issues in Canadian and international climate policy development. To ensure ongoing technical engagement across government and support the work of ministers, establish a federal/provincial/territorial working group of climate policy officials to meet annually to discuss trends and issues in Canadian and international climate policy development. To foster greater interprovincial, regional, and provincial/state collaboration on climate change, the Council of the Federation should highlight and share success stories, lessons, and policy tools by governments and others. Canada needs stronger coordination of climate policy measures between governments to choose a coherent and cost-effective means of achieving targets. This will foster more policy certainty, mutually reinforcing policies; reduced duplication and overlap in efforts; and consideration of alternative policy actions over time. To bring greater certainty to Canada’s climate policy efforts, the federal government should release a plan detailing sectors and timing for future regulatory action under its sector-by-sector approach, setting out time frames, expected emission reductions and cost-benefit information, highlighting complementarity with current federal/provincial/territorial efforts. To encourage continued federal/provincial/territorial actions that avoid duplication and overlap of policies, the federal government should set out the principles and process for using equivalency agreements or other intergovernmental protocols such as MOUs, based on innovation, flexibility, and agreed emission-reduction outcomes and time frames. To complement the federal government’s sector-by-sector regulatory approach and ensure the most effective and lowest cost emission reductions are sought to benefit the Canadian economy as a whole, a base-level carbon pricing regime should be considered upon which governments could add additional measures, with any and all revenue recycling being returned to the jurisdiction in question. Canada needs better climate policy data, information, and forecasts for governments to use that allow for regular evaluation of progress toward its climate policy goals. Independent, transparent, and regular reporting of progress toward targets and goals, and effectiveness of policies and measures is a basic foundation of sound climate policy development that can adapt to changing circumstances. To ensure access to high-quality data for effective policy making, an independent federal/provincial/territorial climate and emissions information group should be established, funded equitably by all governments and managed collectively by governments, to ensure more regular and accurate inputs to both emissions reporting, modelling, and forecasting. To set the stage for regular reviews of climate progress by intergovernmental ministers and Parliament, Environment Canada should add a regular forecasting component based on results from either its own projections or from the independent intergovernmental climate information group to its annual Emissions Trends report detailing short-, medium-, and longer-term projections under various climate policy scenarios. To provide citizens, taxpayers, and policy makers with up-to-date progress on achieving climate policy targets and goals, governments should produce and publish a regular, independent assessment of progress toward goals either within their jurisdiction or nationally for the country as a whole. [s] Representatives from the Government of Saskatchewan’s Department of Environment have noted that, in their view, the NRT’s forecast likely underestimates economic growth in Saskatchewan, and thus the extent to which emissions are likely to increase. This concern may be legitimate; recent trends in Saskatchewan have shown rapid growth in both population and economic activity. A recent short-term RBC forecast suggests that Saskatchewan could have the highest growth rates of all provinces by 2013 (RBC Economics 2012). However, we did not have alternative, long-term macro-economic assumptions that could be used for this modelling. Our forecast is rooted in consistent assumptions about regional and sector-level growth in production drawn from Environment Canada’s modelling, which is in turn based on macro-economic forecasts from Informetrica.